I tend to read in subjects, and lately it’s been Shakespeare, specifically A Year in the Life of William Shakespeare by James Shapiro, The Shakespeare Riots by Nigel Cliff and Shakespeare:The World as Stage by Bill Bryson. 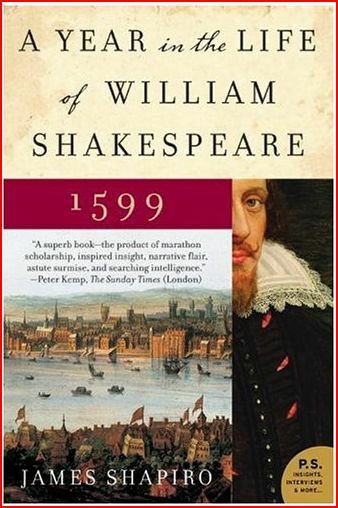 Shapiro’s book takes 1599 as his text, the year William Shakespeare wrote Henry the Fifth, As You Like It, Julius Caesar, and the rough draft of Hamlet. It was the year, Shapiro says, that Shakespeare, at age thirty-five, “went from being an exceptionally talented writer to one of the greatest who ever lived.” This book is a word picture of Elizabethan London so vivid that you’ll smell the Thames at low tide as you read. Three centuries later across the pond, New Yorkers rioted over the relative merits of Macbeth as played by a British actor and an American one. The National Guard was called out, people actually died, and the British actor had to be hustled out of the country for his own safety. America had embraced Shakespeare as one of their own, and he was read so extensively and so intensively that audiences from rural Kentucky to California gold mines could shout out the correct line when an actor in performance stumbled over it. Author Cliff concludes, “Once a voice carried a people across a continent and helped forge a brave new world. No other writer has been so powerful, and no one ever will be again.” This book includes a survey of 19th century American history, a history of Western theatre, is peopled with great characters and you-are-there settings, and has a quotable phrase on nearly every page. 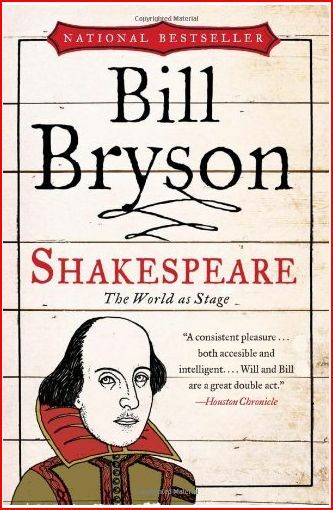 Bill Bryson brings his trademark witty style to his biography of the bard, but my absolute favorite chapter is the last one, wherein Bryson annihilates the notion that Shakespeare didn’t write Shakespeare. From eccentric Delia Bacon, a Francis Bacon adherent and wannabe relation, to the trio of alleged scholars rejoicing in the names of Looney, Silliman, and Battey arguing for the Earl of Oxford, to the theory that Christopher Marlowe was the real author of the plays (“He was the right age,” Bryson writes, “had the requisite talent, and would certainly have had ample leisure after 1593, assuming he wasn’t too dead to work.”), Bryson really enjoys himself, and, believe me, so will you.